Consumers have the option to auto-bag or vend ice directly into a cooler. Bag of Ice does not charge you franchise fees, force you to purchase ice bags from us or insist you participate in costly maintenance agreements. Other start up cost include providing electric service, an approved water source and drainage to your vending machines installation location. If the ground around your location isn’t stable, a slab would also be required. Bag of Ice uses insulation to keep ice frozen in the ice storage bin instead of refrigeration. This greatly reduces your electric bill and maintenance cost. As a bonus, it is better for the environment. Bag of Ice uses ice makers specifically designed to function in the higher temperatures. These ice makers have remote condensers combined with our proprietary cooling system allow them to continue to function efficiently during the warmer months. Bag of Ice offers a cold weather kit to improve your performance during the colder months. We feel it is an unfair business practice to ask you to pay for a geographical area that cannot be protected, as we cannot prevent competitors from installing a similar vending machine nearby your location or locations. It is also our belief that the tens of thousands of dollars other companies charge for purchasing a territory is much better spent on purchasing more machines for your business! Our vending machines are the sturdiest, well built in their class. Our frames are built with heavy-duty 2×2 structural corrosion free aluminum. In addition, our ice augers and beater bars are extraordinarily strong and are made of food-grade stainless steel like our ice storage bins. The exterior, as well as the roof enclosing the machines, are constructed with corrosion-free aluminum. Our machine fronts are made of food-grade stainless steel. There are no moving parts made of plastic on the machine. All motors and components are the finest available. All equipment needs maintenance, but because our machine has the fewest moving parts, our machines require the least. Weekly – Monthly (depends upon environment) – Clean coin mechanisms, bill acceptors Quarterly – Change sediment filter Biannually – Check all filters and clean icemaker if needed. Annually – Replace UV bulb & lubricate components. Hard-water issues and heavy use can increase the frequency of the above. 10, 16 & 20 lb. 10, 16 & 20 lbs. What is a Bag of Ice Purified Water & Ice vending machine? 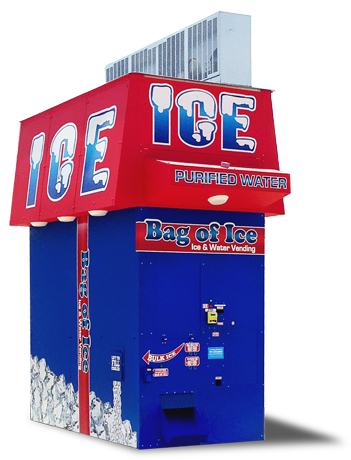 Bag of Ice manufactures multiple models of coin, bill, debit or credit card, coupon, gift card, or token operated ice & purified water vending machines that dispense ice into a bag or cooler as well as purified water by the gallon that fills your customer’s containers. HD Models - All HD models come equipped with online sales reporting and the largest quantity of notifications and remote features in the industry. SF Models - If you choose to accept credit and debit cards you will receive online sale reporting at no additional charge. Notifications and remote features are available but not included. What is the SmartTech Cooling System? All HD models come equipped with our SmartTech internal cooling system. This cooling system delivers precooled water to assist the icemaker during hot temperatures, optimizing ice making production. What are icemaker remote condensers and why do you offer them? Ice makers are commonly manufactured in two configurations, self-contained or with remote condensers. Self-contained icemakers consist of all the necessary components, including the cooling unit called the condenser, to manufacture ice in one box. These ice makers loose production capacity as water and air temperatures rise; most loose a majority of their capability to manufacture ice once the temperatures reach 90-95 degrees. Ice makers with remote condensers (IRC) separate this hot component away from the ice maker, similar to your home HVAC system where the air-handler is often inside your house and your condenser is outside. Separating the condenser from the ice maker allows the ice maker to be more protected and insulated while maintaining its production capability, mostly unaffected by temperatures ranging from 36-95 degrees. 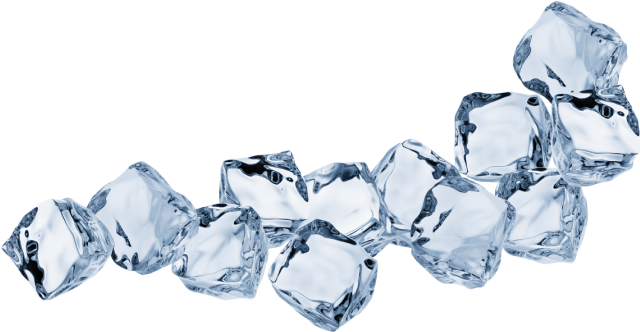 Unlike self-contained ice makers, IRC’s will remain operational up to 105 degrees with only a marginal amount of production loss. Those located in regions where temperatures do not generally rise above 85 degrees will have the option of utilizing self-contained icemakers, understanding the required self-contained icemaker’s ventilation will prevent the ice vending machine to be operational in sub 40 degree temperatures. What does the “HD” stand for following the model #? The “HD” is short for Heavy Duty.” Our vending machines are the most sturdy, well-built in their class. Our frames are built with heavy duty 2×2 structural corrosion free aluminum. In addition, our ice augers and beater bars are extraordinarily strong and are made of food-grade stainless steel like our ice storage bins. The walls, as well as the roof enclosing the machines, are constructed with corrosion-resistant aluminum sheet. There are no moving parts made of plastic on the machine. All motors and components are the finest available. For example, we only place Hoshizaki icemakers in our vending machines. What are expandable ice vending machines? The BOI 1000 HD & BOI 1500 HD models accept more than one icemaker. The BOI 1000 HD can accept two icemakers; doubling the amount of ice being manufactured and decreasing the time it takes to replenish the 1000 lb. Ice Storage Bin. The BOI 1500 HD can accept up to four icemakers; quadrupling the amount of ice being manufactured, equaling the production of ice houses costing $120K or more, and decreasing the time it takes to replenish the 1500 lb. Ice Storage Bin. Why does BOI manufacture 4 different ice and water vending machine models? Good Location + Appropriate Equipment = Good Return On Investment (ROI) Different locations sell different quantities of ice. It is equally important to choose the appropriate equipment as it is to choose a good location. Our definition of a good location is one that maximizes the machine's capabilities as often as possible. 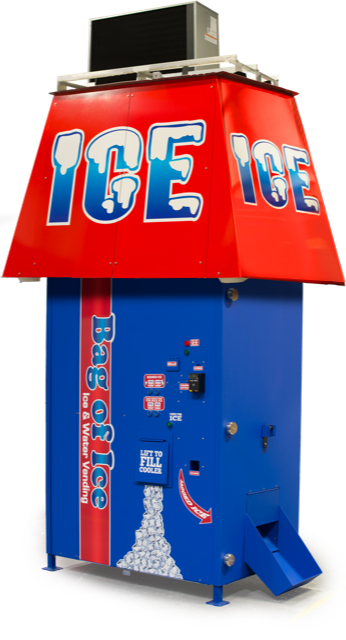 Bag of Ice helps to qualify locations and to insure that you don’t over invest or purchase a vending machine that is more capable and more expensive than what is required. Making a poor choice will lengthen the time it takes for you to “breakeven” and will affect your “ROI”(return on investment).Ice & water vending machines have become more compact and can now be placed at locations once reserved for soda and snack machines, especially locations in front of stores where ice storage freezer once sat. Large unattractive icehouses are now obsolete and are being replaced with smaller footprint ice & water vending machines similarly capable for a much smaller investment. No Refrigeration…how does the ice stay frozen? Our stainless steel ice storage bins, as well as the vending machine walls, are very well insulated which limits the amount of collective ice melt. When collective ice melt does occur, the ice storage bin is replenished by the icemaker. All collective ice melt is removed and is used to pre-chill water returning to the icemaker, increasing its production capability. 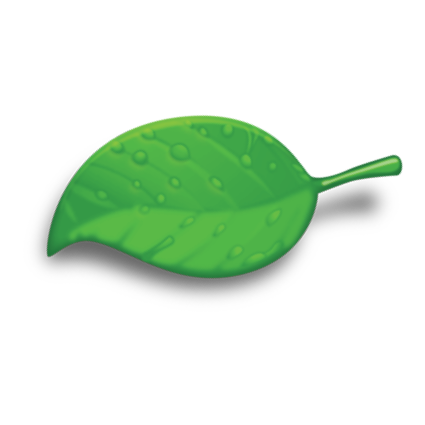 This process is not only more energy efficient/green, it is also much less expensive than the than utilizing refrigeration, as there will be no high refrigeration-related utility bills and maintenance expenses. Where are the best-suited locations for ice and purified water vending businesses? Convenience Stores - Why pay $.80 per to $1.50 per 10 lb. bag from ice vendors when you can make your own for around .25¢ per bag? Car Wash - Car wash owners are familiar with this concept and advantages such as our lower maintenance compared to other company’s ice vending machines. Grocery Stores- Save valuable freezer merchandising space for more products to sell. RV / Mobile Home Parks & Camp Grounds- Make every square foot of your property profitable! Parking Lots - Why not use your parking lot to make you money as well? Capitalize on the drive-up convenience of Bag of Ice vending machines. Marinas & Boat Ramps - Whether you are near or on the way to a popular body of water, fisherman & boating enthusiasts always start their day with a chest full of ice! Strip Centers - Bag of Ice vending machines have very small footprints, so strip center owners can make extra money without interfering with existing tenants. Obviously, the locations best suited for Bag of Ice vending machines are those that have good visibility and traffic. Equally important to choosing a good location, insure that you choose the correct equipment for that location. 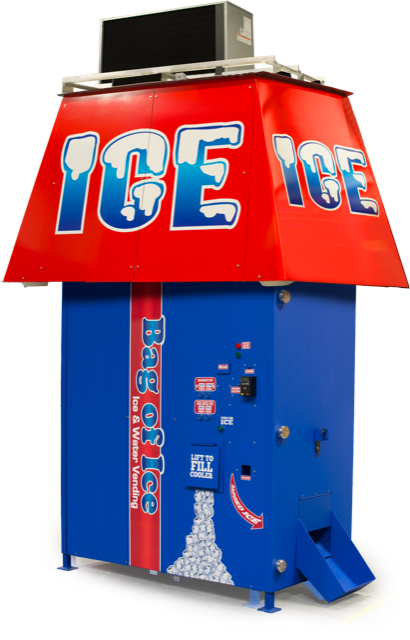 Bag of Ice manufactures four different ice & water vending machines, each with different ice production and storage capabilities. A good location maximizes the machines capabilities as often as possible. If you are not going to sell 2000 pounds of ice per day, you do not want to pay for a machine with that capability. How much ice & purified water can me made per day? Each Bag of Ice vending machine model has different capabilities. For example, the BOI 1000 stores 1000 pounds of ice in its food grade stainless steel storage bin. 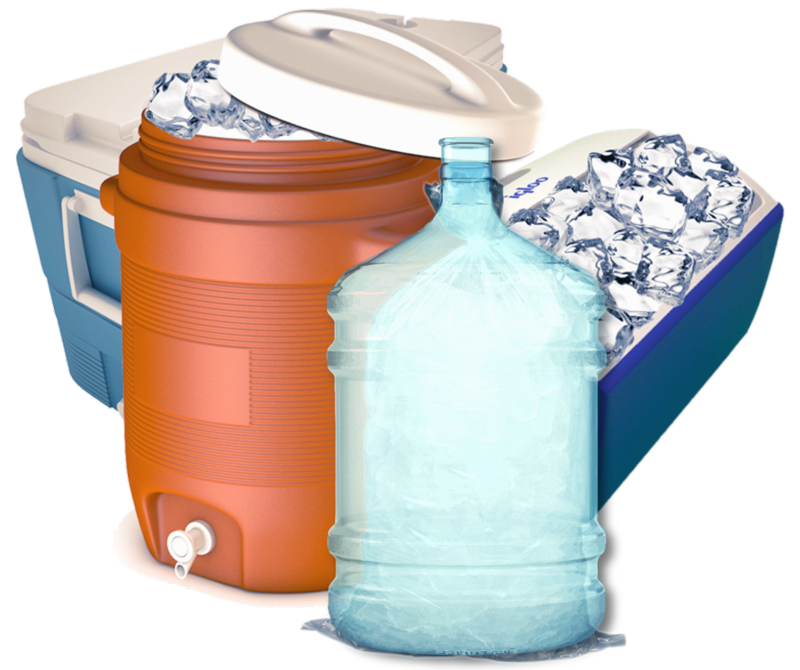 As ice is purchased/vended, the ice maker replenishes the ice storage bin, up to 2500 pounds in 24 hours. As demand requires, the BOI 1000 can be equipped with a second ice maker increasing it’s replenishment capability up from 2500 to 5000 pounds in 24 hours. Alternatively, the BOI 1500 has a 1500 lb. storage bin capacity. There are generally no limits to the amount of water that can sold per day, unless you are utilizing a quantity specific reverse osmosis system. What does Purified Water sell for? Purified water dispensed from vending machines usually sells for 25¢ to 50¢ per gallon. How much does a 10, 16, or 20 lb. bag of ice sell for? $1.75 – $6.00 for a 20 lb. bag of ice. The average cost of making a 10 lb. bag of ice is only .25¢ each including the bag and utilities in most cities! What does it mean to be NAMA certified? NAMA is a third party organization that evaluates ice and water vending machines against federal guidelines for sanitation and consumer safety. This voluntary program ensures that our products are independently evaluated to ensure that we comply with all Federal Guidelines for sanitation and consumer safety. "The Bag of Ice team defines Customer Service and Support. Talk about a hands on approach, everyone from the call center staff to the service technicians to the president truly care your machine and business. As a first time business owner, its nice to know you have that kind of support and I know this has translated into the success of my ice vending business." "Very happy with the service, should have done this a long time ago"
Thanks for all your support in getting my machine up and running. Please thank all your staff for me at Bag of Ice. Everyone did a great job.